According to some embodiments of the present invention, a first partition may comprise the first graphic-list element, “DrawText (Text1, Text2, Text3, Text4, Text5),” in the graphic list. The first partition may be associated with text-type graphical objects. A second partition may be formed when the second graphic-list element, “DrawRectangle (red),” is examined because the second graphic-list element is not a text-type graphical object. The second partition may be associated with vector-type graphical objects and may comprise the second graphic-list element. A third partition may be formed when the third graphic-list element, “DrawText (Text6, Text7),” is examined because the object type changes from vector to text. The third partition may be associated with text-type graphical objects and may comprise the third graphic-list element. A fourth partition may be formed when the fourth graphic-list element, “DrawEllipse (blue),” is examined because the fourth graphic-list element is a vector-type object and the current (third) partition is associated with text objects. The fourth partition may be associated with text-type graphical objects and may comprise the fourth graphic-list element. A fifth partition may be formed when the fifth graphic-list element, “DrawPatch (pictorial_image—1),” is examined because the fifth graphic-list element is a bitmap-type object. The fifth partition may be associated with bitmap objects and may comprise the fifth graphic-list element. A new partition is again required when the sixth graphic-list element, “DrawRectangle (green),” is received because the object type changes from bitmap to vector. The sixth partition may be associated with vector objects and may comprise the sixth graphic-list element. A seventh partition may be formed when the seventh graphic-list element, “DrawPatch (pictorial_image—2),” is examined because the object type changes from vector to bitmap. The seventh partition may be associated with vector objects and may comprise the seventh graphic-list element. According to some embodiments of the present invention, a first partition may comprise the first and second graphic-list elements, “DrawEllipse (red)” and “DrawRectangle (red),” respectively, since both elements are vector-type elements. The first partition may be associated with vector-type graphical objects. A second partition may be formed when the third graphic-list element, “DrawText (Text6, Text7),” is examined because the third graphic-list element is not a vector-type graphical object. The second partition may be associated with text-type graphical objects and may comprise the third graphic-list element. A third partition may be formed when the fourth graphic-list element, “DrawEllipse (blue),” is examined because the object type changes from text to vector. The third partition may be associated with vector-type graphical objects and may comprise the fourth graphic-list element. A fourth partition may be formed when the fifth graphic-list element, “DrawPatch (pictorial_image—1),” is examined because the fifth graphic-list element is a bitmap-type object and the current (third) partition is associated with vector objects. The fourth partition may be associated with bitmap-type graphical objects and may comprise the fifth graphic-list element. When the sixth graphic-list element, “DrawPatch (pictorial_image—2),” is examined, it may be added to the current (fourth) partition because it is the same object type as the object type that is associated with the fourth partition. The fourth partition may further comprise the sixth graphic-list element. A fifth partition may be formed when the seventh graphic-list element, “DrawRectangle (green),” is examined because this graphic-list element is a vector-type object and the current partition (fourth) is associated with bitmap-type graphical objects. The fifth partition may be associated with vector objects and may comprise the seventh graphic-list element. 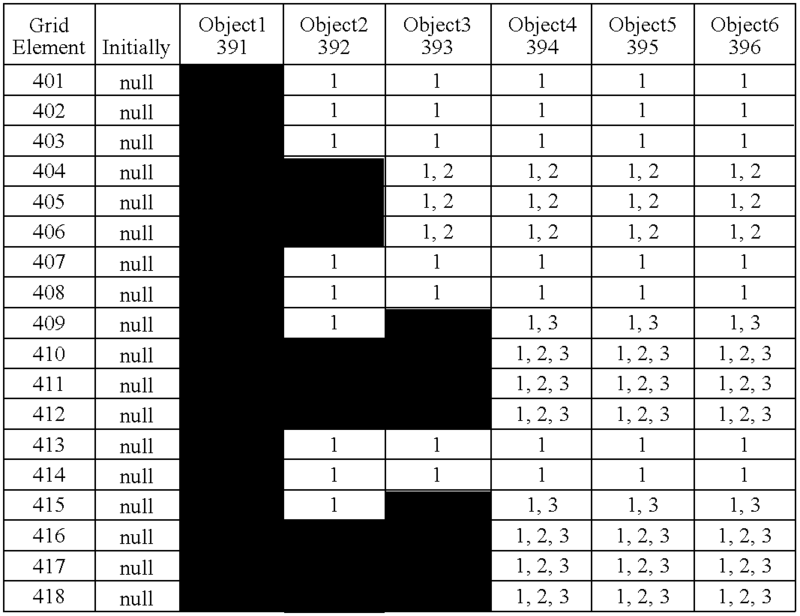 In “by-object-run-partitioning” embodiments of the present invention, rendering 24 of the partitions may occur concurrently or “out-of-order” on multiple rendering processors. In some embodiments, a processor on which a partition is rendered may be selected based on the graphical-object type associated with the processor. The resultant rendered partitions may be bit-blit 26 sequentially, wherein intermediate bit-blitting may be performed concurrently. For example, for six rendered partitions denoted P1, P2, . 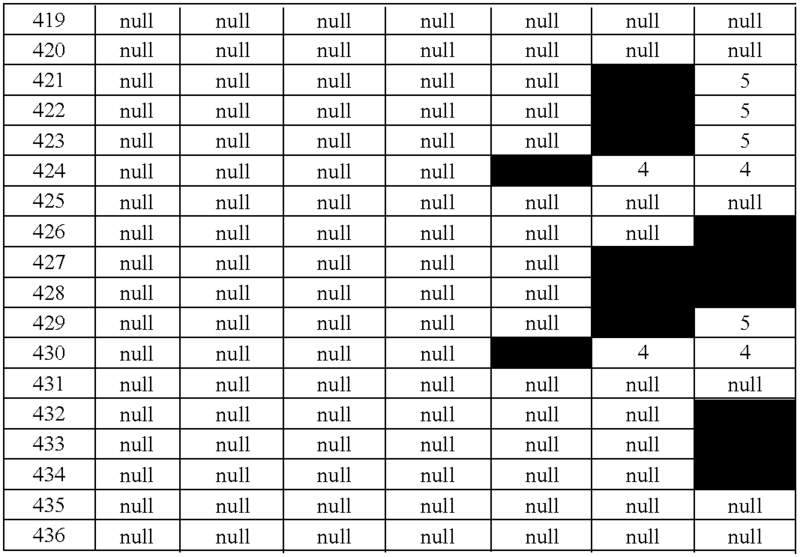 . . , P6, the bit-blit may be performed sequentially in the order P1, P2, P3, P4, P5, P6. Alternatively, P1 and P2 may be bit-blitted sequentially forming an intermediate bit-blit result denoted P1P2. P3 and P4 may be bit-blitted sequentially forming an intermediate bit-blit result denoted P3P4, and P5 and P6 may be bit-blitted sequentially forming an intermediate bit-blit result denoted P5P6. Three bit-blitters may form these intermediate results concurrently, and the intermediate bit-blit results may be bit-blit sequentially in the order P1P2 P3P4 P5P6. Still alternatively, P1, P2 and P3 may be bit-blit sequentially forming an intermediate bit-blit result denoted P1P2P3, and P4, P5 and P6 may be bit-blit sequentially forming an intermediate bit-blit result denoted P4P5P6. These intermediate results may be bit-blit sequentially in the order P1P2P3 P4P5P6. Sequential bit-blit may refer to in-order bit-blit between adjacent partitions and in-order bit-blit between intermediate bit-blit results. Therefore, in some embodiments of the present invention, sequential bit-blitting may be performed by concurrent intermediate bit-blitting. A first graphic-list-element bounding shape 391 associated with object1 may be placed on the page grid 390. The grid elements 401-418 on which the first bounding shape 391 is placed may be examined. The labels for these grid elements 401-418 may be changed from “empty” to “occupied,” and object1 may be associated with these grid elements 401-418. A second graphic-list-element bounding shape 392 associated with object2 may be placed on the page grid 390. The grid elements 404-406, 410-412, 416-418 on which the second bounding shape 392 is placed may be examined. 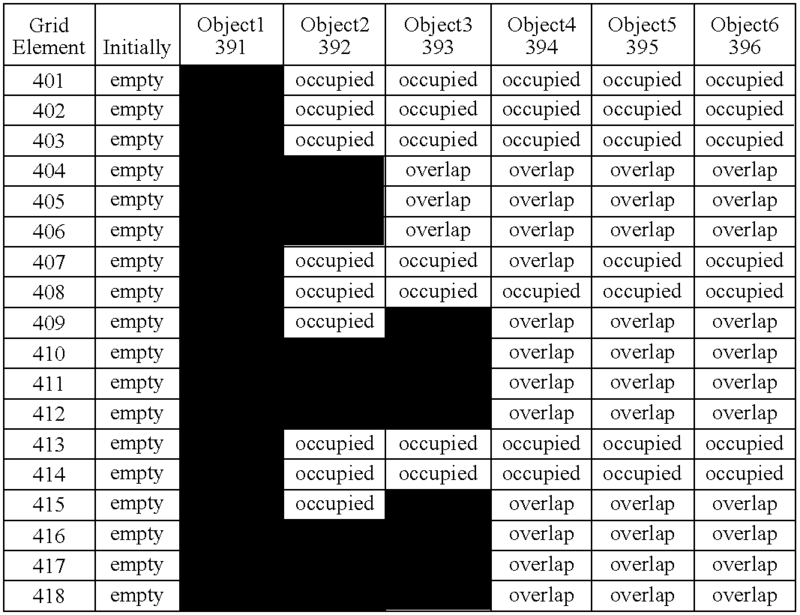 The labels for these grid elements 404-406, 410-412, 416-418 may be updated from “occupied” to “overlap,” and object2 may be associated with these grid elements 404-406, 410-412, 416-418. Additionally, the overlap lists for object1 and object2 may be updated to reflect that these objects overlap. d) associating any graphic-list element in said first plurality of graphic-list elements not in said second plurality of graphic-list elements with a second partition. b) rendering said second partition on a second renderer. 3. The method as described in claim 2, wherein said rendering said first partition and said rendering said second partition occur substantially concurrently. b) bit-blitting said rendered second partition to said page memory. 5. The method as described in claim 4, wherein said bit-blitting said rendered first partition and said bit-blitting said rendered second partition occur substantially concurrently. b) sub-partitioning said second partition based on graphical-object type. b) said second partition sub-partitions are rendered sequentially. e) when said first spatial region overlaps with at least one of said spatial regions associated with said at least one additional graphic-list elements, associating said first graphic-list element and said at least one overlapped at least one additional graphic-list elements with a second partition. 10. The method as described in claim 9, wherein said rendering said first partition and said rendering said second partition occur substantially concurrently. 12. The method as described in claim 11, wherein said bit-blitting said rendered first partition and said bit-blitting said rendered second partition occur substantially concurrently. ii) said first graphic-list element with a second partition when said overlap status does not indicate overlap between said first graphic-list element and at least one other graphic-list element in said first plurality of graphic-list elements. b) a second renderer for rendering said second partition. 17. The printing system as described in claim 16, wherein said first renderer and said second renderer operate substantially concurrently. c) a second bit-blitter for bit-blitting said rendered second partition to said page memory. 19. The printing system as described in claim 18, wherein said first bit-blitter and said second bit-blitter operate substantially concurrently. 20. The printing system as described in claim 15 further comprising a sub-partition generator for sub-partitioning said first partition based on graphical-object type and sub-partitioning said second partition based on graphical-object type.